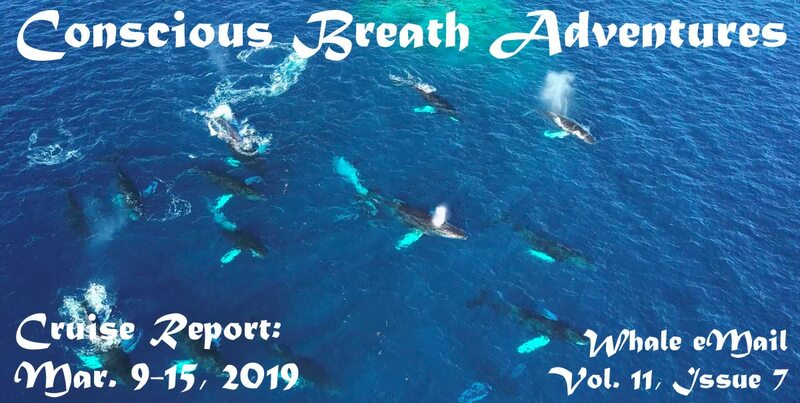 Hello again to all our readers and welcome to our Cruise Report for Week 7 of Conscious Breath Adventures’ 2019 Silver Bank humpback whale season. My apologies for the delay in getting this Report out to you. Unfortunately we were experiencing some technical difficulties that set back our schedule last weekend. Happily everything is back on track now. On with our Report! 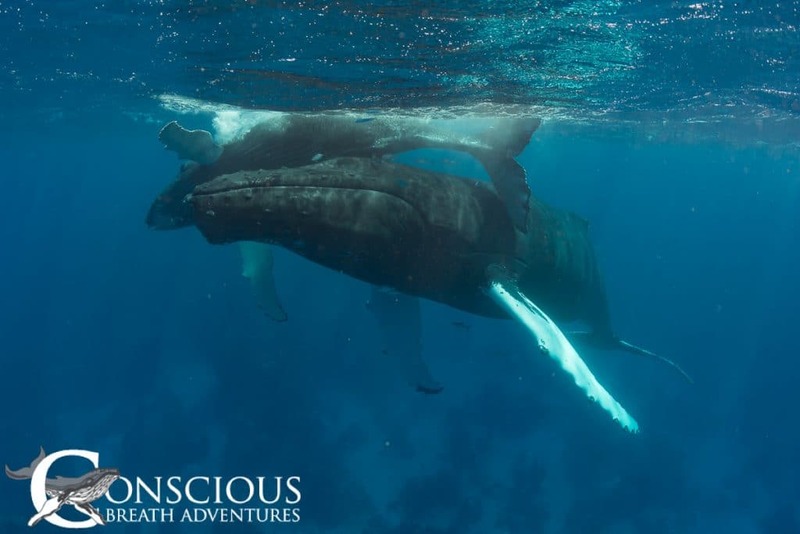 Every Sunday morning, upon our arrival to our mooring, I spend some time introducing to our guests the protocols and techniques we will use when we swim with the humpback whales: what to do and what not to do, and what to expect in a few of the most common scenarios. Whether it is an encounter with a resting mother and calf, or two adults, or even a singing male humpback like last week, the approach is essentially the same, with guests entering the water quietly and lining up next to the in-water guide to passively observe the stationary whales. But the last situation is a bit different, swimming with a pair of dancing whales, which is much less scripted and much more dynamic. As you know, individual humpbacks can be identified by the unique markings on the underside of their tails, a technique known as fluke identification, or fluke ID for short. But it is possible to identify individuals based on scars, scratches and other unusual or distinct markings. 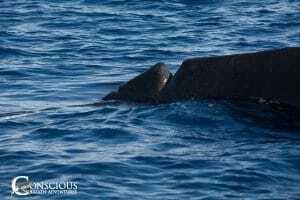 Sometimes it can be something very unusual, as in the case of this whale, sighted with what looks like a naturally deformed, double dorsal fin of sorts. While it is possible that the deformity is from an entanglement resulting in a split fin, the overall appearance leads me to believe that it is like that naturally, from birth. 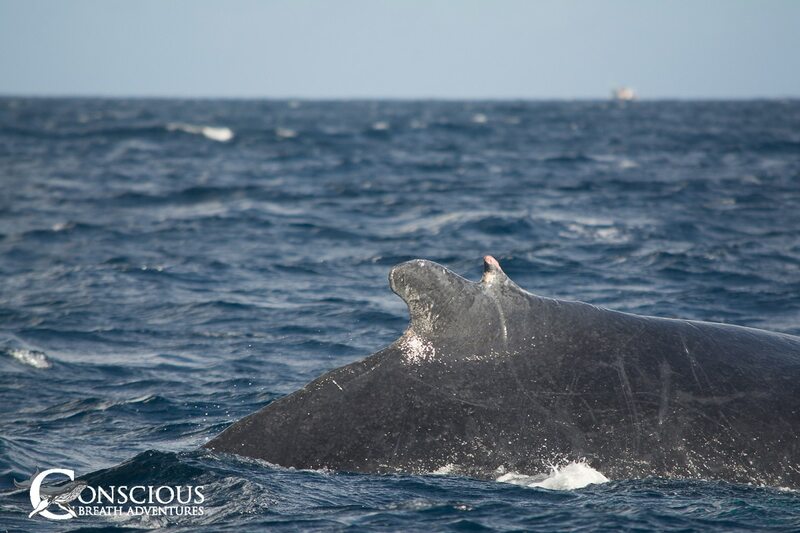 The raw, red tip is because the skin has been chafed off during competitive interactions so I would also assume that this whale is a male. 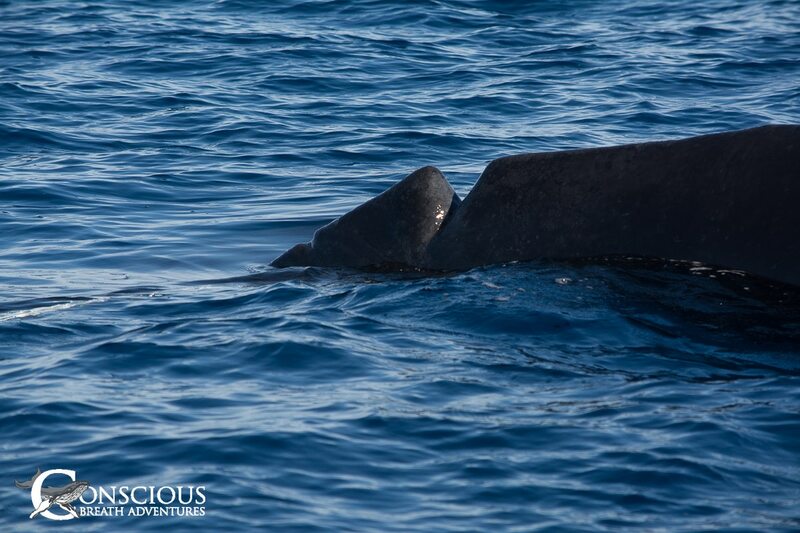 We also had a fun interaction with another distinctly marked whale, this one a female with a calf. Her identifying feature is a deformed fluke and especially a tail stock with a deep but healed “V” shaped notch on the back. All of this is the result of some previous and very serious entanglement that left her badly wounded. Fortunately she recovered but still bears the scars from her ordeal. This particular wound seems like it must have some effect on her swimming abilities but if so it did not show as she moved about normally. Our time with her and her calf was a delightful as the pair rested in calm, clear water all morning, with the easygoing calf approaching the swimmers to roll around playfully and curious mom making exciting close passes on each breath cycle. 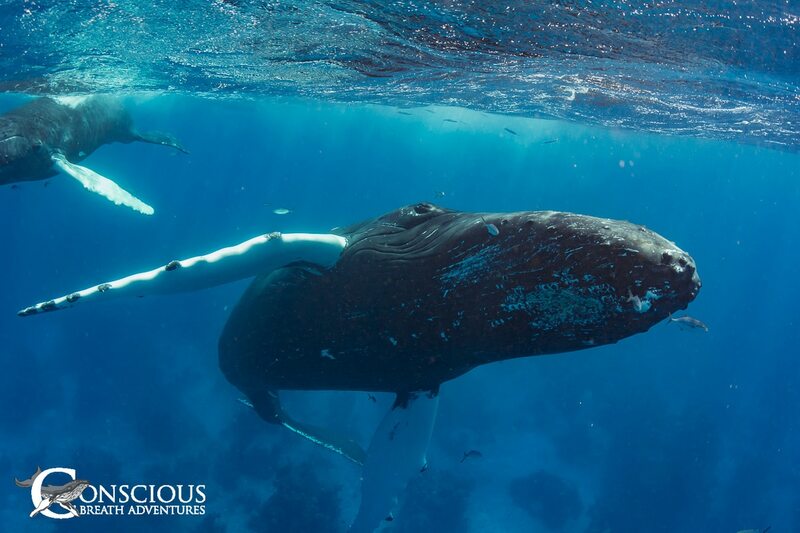 They were super swimming companions who gave all our guests a wonderful interaction. It’s like that wild elephant thing all over again! On another beautiful morning, during breakfast a large competitive group of “rowdy” males could be seen in the distance blowing like a steam train on the horizon. Over time they approached and ended up passing just a few hundred yards from the boat on her mooring. That is easily within range of our drone so I flew it out to film the action of what turned out to be fourteen fighting males and a single female as they charged into the coral reef, a big obstacle course for the group of madly rushing whales. The video is stunning but limitations with internet access prevented an upload so I will have to share that with you later. However, the header image at the top gives a quick snapshot teaser. Like last week, our whole group also got to share an exciting swim with a singing male whale, with the full bone-shaking sensation that comes with. It has been an excellent few weeks with the singers and we are very happy to be their audience as they . Even as many times as we have had this peak experience, you just can’t help but wonder what this huge animal, dozens of miles from shore and so far removed from the average human existence in so many ways, what is it trying to communicate? Why do they sing and what is the desired reaction? What is it all about? No one knows yet and I always tell our guests that whoever figures out the answer to those questions will be both rich and famous! The song changes and evolves from year to year, even a little bit from the start of the season until the end. If you are curious to hear how the song has changed over time, dig back into our archives posted on our SoundCloud page.